1. Cover the potatoes and parsnips with water in a large saucepan; boil for 10-15 minutes until soft. 2. Meanwhile in a large pan, dry fry the pork and apple sausages for 12-15 minutes until cooked through. Add the light beer and simmer for 2-3 minutes. Add the sugar and gravy granules; cook until thickened. 3. Drain the potatoes and parsnips, and mash with a knob of butter and a dash of milk. 4. 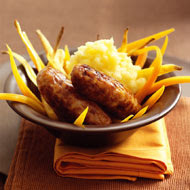 Serve the sausages with the potato and parsnip mash and beer gravy. 1. Warm the oil and butter in a heavy-based casserole over medium heat. Add the onion and gently fry for about 5 minutes until softened and translucent. Add the celery, carrots and garlic, and cook for another couple of minutes, stirring to coat well. 2. Stir in the beef with a large pinch of salt and several grindings of black pepper. Cook, stirring, until the beef has lost its raw pink look. 3. Add the bay leaves and milk, bring to the boil, then simmer gently for about 10 minutes, until the meat has absorbed the milk. Season with a pinch of nutmeg. 4. 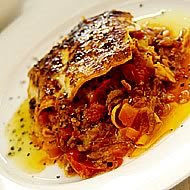 Pour in the wine and let it simmer until it has evaporated, then add the tomatoes with their juice and stir thoroughly. 5. Cook, uncovered, at a lazy simmer with just an intermittent bubble breaking through the surface, for 3 hours or more. The fat will have separated, but the sauce will not be dry. Taste and correct the seasoning. 6. About 45 minutes before the meat is ready, make the béchamel sauce. Pour the milk into a saucepan with the bay leaf, onion and a generous pinch of nutmeg. Bring to just below the boiling point, then remove from the heat and leave to infuse for 15-20 minutes. 7. Preheat the oven to 180°C/gas 4. Grease a shallow baking dish. 8. Melt the butter in a saucepan, stir in the flour and cook, stirring for 1 minute. Strain the milk, then gradually stir it into the flour mixture to make a thick smooth sauce. Season to taste. 9. Pour some béchamel into the baking dish - enough to just cover the base. Place a layer of lasagne sheets on top, followed by a layer of meat sauce, another layer of béchamel and a good handful of Parmesan. Continue with two or three more layers until both sauces are used up. Add a final sprinkling of Parmesan. 1. Heat 2 tablespoons of olive oil in a heavy-based pan. Season the chicken pieces and quickly brown them on all sides. Set the chicken aside and cook the onion in the same pan until soft and just colouring. Stir in the garlic, cinnamon and ginger, cooking for about a minute. Tip in the tomatoes, mix everything together well, turn down the heat, and cook for a further 15 minutes, stirring from time to time. 2. Boil the water or stock and dissolve the saffron in it. Pour this over the vegetables and bring the whole thing up to the boil. 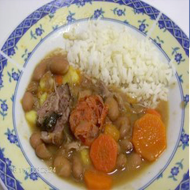 Set the chicken pieces on top, together with any juices that have leached out of them, and spoon the liquid over them. Turn down to a gentle simmer, cover and cook until the chicken is tender - it should take about 30 minutes but check after 25 minutes. 3. Remove the chicken pieces, set them aside, cover and keep warm. Now bring the juices to the boil and simmer until well reduced to a kind of 'cream' - it shouldn't be at all sloppy. Add the honey and continue to cook until well reduced and jam-like. Check the seasoning and add the orange flower water. Put the chicken pieces back and warm them through in the sauce. 4. 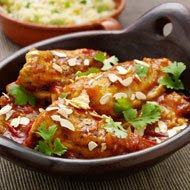 Serve with a sprinkling of toasted almonds and chopped coriander on top and couscous or flat bread on the side. 1. Put the parsley in a food processor and blend until finely chopped. Add the rosemary, thyme and garlic and blend again. Add the breadcrumbs a handful at a time until you are left with a fine, vivid green mixture. 2. Preheat the oven to 240C/gas 9. Season the lamb all over with salt and pepper. 3. Heat the butter and oil in a large frying pan or roasting tin until hot and foaming. Add the lamb racks and cook, for approximately 5 minutes, or until browned on all sides. Transfer to the hot oven for 4 - 5 minutes or until cooked to your liking, then remove and leave to rest for at least 10 minutes. 4. For the Niçoise garnish: heat 2 tablespoons of olive oil in a small frying pan over a medium heat and cook the courgette for 2-3 minutes, or until softened. Remove from the heat and set aside. 5. Place the cherry tomatoes, still on the vine, in a baking tray and drizzle with the remaining olive oil. Season and sprinkle over the sugar and vinegar. Roast for 5 minutes until the tomato skin starts to blister. Remove and set aside, keeping warm. 6. Brush the lamb with the mustard, then roll it in the breadcrumb mixture to coat all over and return to the oven for 5 minutes. 7. Mix the courgette, olives and basil in a bowl and season. 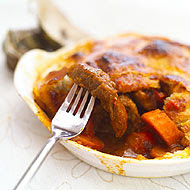 Remove the lamb from the oven and rest it briefly before cutting into slices. Place 2-3 cutlets on each plate, together with a bunch of tomatoes. 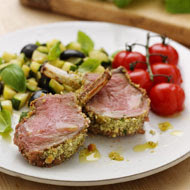 Spoon the courgette mixture around the lamb and finish with a drizzle of olive oil. 1. Place all the marinade ingredients in a blender and process until smooth. 2. Rub the beef with salt and pepper before pouring over the marinade. Put the beef and the marinade in an air-tight plastic bag and leave overnight in a cool place. 3. Preheat the oven to 200C/gas 6. Remove the beef from its bag and place in a roasting tin. Spoon over a couple of tablespoons of the marinade. 4. 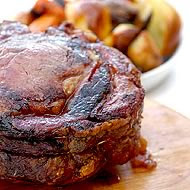 Roast the beef for 30 minutes, longer if you prefer the meat well-cooked. Spoon over the juices once or twice during cooking. 5. While the beef is roasting, make the salsa. Tip all the salsa ingredients into a blender and process until smooth. 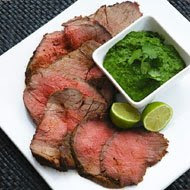 Taste for seasoning and serve at room temperature with the hot roast beef. 1. To make the batter; sift the flour and bicarbonate of soda into a mixing bowl. 2. Mix together the water, vinegar, bitter and ginger and pour gradually into the flour, whisking to a smooth batter. 3. Cut the brill fillets into thin strips. Place in a bowl and add the coriander, Worcestershire sauce, soy sauce and five spice powder. 4. Cut the potatoes into chips measuring approximately 1 x 5cm each. 5. 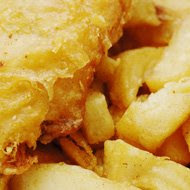 Heat the vegetable oil in a deep-fat fryer or large pan to 120C and deep fry the chips for about 5 minutes until soft but not coloured, then drain. 6. Increase the oil temperature to 160C and re-fry the chips until crisp and golden. Season with sea salt. 7. Dust the brill strips with the plain flour and then dip in the batter to coat them. 8. Deep fry in the oil until the batter is crisp. 9. To make the pea emulsion; blend the egg, peas, Dijon mustard and white wine vinegar together. 10. Drizzle in the olive oil, stirring all the time and season to taste with salt and pepper. 11. To serve; stack the chips and arrange the fish fingers on heated plates. Spoon on some of the pea emulsion and a sprinkling of salt and vinegar. 1. Season the flour and toss the steak and kidney in it to coat. 2. Heat the oil and butter in a large pan and fry the meat for 5 minutes or until brown. 3. Add the onions and cook for another 3-4 minutes, stirring. 4. Add the bay leaves, stout and stock. 5. Stir in the gravy browning and cook for 2-3 minutes, until thickened. 6. Cover and simmer for about 1 hour and 30 minutes, until the meat is tender. 7. For the pastry, mix the flour and salt together and gently add the butter. Make a well adding the water and bring lightly together to make a dough. 8. Roll out into a rectangle and mark into thirds. Fold over the end thirds into the centre one, turn through 90º and repeat two more times. Chill for half an hour. 9. 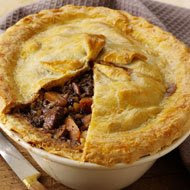 When the meat is cooked, cool slightly and tip into a pie dish. Roll out the pastry on a floured surface a little bigger than the size of the dish using the trimmings to make a strip the width of the rim. 10. Brush the rim of the pie dish with beaten egg and lay the pastry strip on top to make a seal. Brush again with egg and lay the lid on top. Crimp or flute the edges, brush the lid with the remaining egg and make a slit in the top. 11. Bake for about 20 minutes, until golden. Serve with buttered spring cabbage and mashed potato. 6. When ready, remove the beef from the pan and allow to rest for ten minutes before serving. Reserve the pan juices to make Red Wine Gravy .